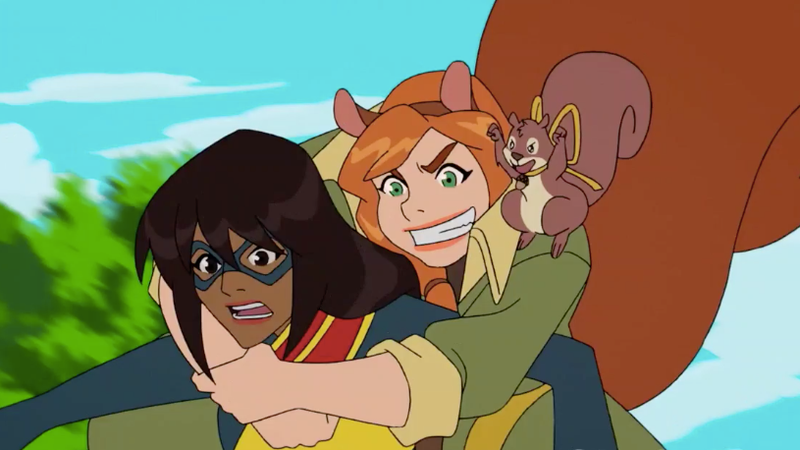 When Marvel and Disney released the six Marvel Rising: Initiation animated shorts this summer, the assumption (reinforced by Marvel) was that they would serve as a calling card for the then-upcoming Secret Warriors TV movie, showing off the fun and breezy potential of these heroes. The shorts were brief but spirited, and while they were clearly targeted toward the tween audience, decent writing and a sense of narrative possibility gave the hopeful promise of better to come. The film is now here, and while it maintains some of those better elements of Initiation, it struggles to match the pacing and quality of writing that preceded it. The main demographic for this story appears to have been reduced even further, from tweens to younger kids, as the story and characters have largely been transformed into more reductive, black-and-white versions of their former animated selves—ironic, considering this narrative of Inhuman imprisonment and doing what’s right in the face of adversity is a cautionary tale about the danger of taking things at face value. In the case of Secret Warriors, an origin story for a new team of younger heroes focused on giving women and people of color the spotlight they too often miss in the live-action Marvel adventures, the danger comes in the form of Kree invaders. Kamala Khan and Doreen Green, a.k.a. Ms. Marvel and Squirrel Girl (Kathreen Khavari and Milana Vayntrub, still the best parts of this animated universe), literally stumble upon Dante (Tyler Posey), a teenage Inhuman with flame powers, battling another young Inhuman named Victor (Booboo Stewart). Soon, they find they’ve happened upon a global problem of disappearing kids, and an unexpected encounter with S.H.I.E.L.D. agents Daisy Johnson (Chloe Bennet) and Rayshaun Lucas (Kamil McFadden) leads to a fraught alien-heavy situation for Kamala and Doreen, as they try to save the day, solve the mystery, and still maintain Doreen’s ability to deliver high-quality mid-fight quips. That’s to say nothing of the mysterious America Chavez (Cierra Ramírez), a motorbike-riding tough who’s much more than she seems. It’s a lot to get through, and Secret Warriors often wobbles in the execution. First off, anyone who watched Initiation expecting it to be some sort of narrative launchpad for Warriors is bound to be disappointed, as that series’ main character, Spider-Gwen (Dove Cameron), is nowhere to be found, nor is the central storyline it introduced. But even the new characters get uneven introductions: It’s a good 20 minutes after she appears before we learn anything about America, and sturdy characterization in general suffers here. Doreen, ostensibly Kamala’s BFF, utters some jarringly tone-deaf anti-Inhuman words just to provoke a fight between the two friends, a point of view even the film doesn’t really seem to think is justified. (“That’s not who I am,” Doreen is still telling herself during the movie’s final act.) And characters who were previously at least semi-mature act even more like children—especially Rayshaun’s Patriot—with no good reason other than to perhaps better resemble the youthful target audience. Luckily, we still have Kamala Khan. Ms. Marvel takes center stage in the story, as Kamala struggles to figure out how best to make a difference with her abilities. 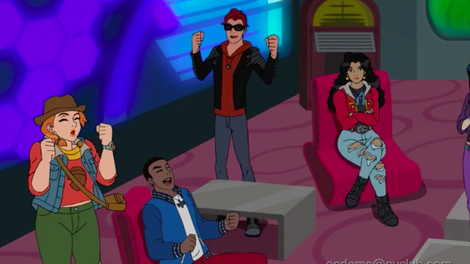 Her unabashed worship of Captain Marvel is used as a blatant tool to teach viewers about the importance of being yourself, but even with the simplistic dialogue, Khavari makes the teen hero an endearing and relatable dork, someone who gets exasperated at her mom’s hectoring—but not so upset that she isn’t simultaneously eager to hear some words of encouragement from her Ammi. As with the other Inhumans she encounters, her powers are a metaphor for adolescence, as their bodies start to do strange and unusual things they can’t fully control. Zeroing in on her journey helps anchor the more outsized drama to a recognizably human concern, as well as keeping a sympathetic character at the forefront (especially helpful when others like Rayshaun are behaving in such broad, wooden strokes). And even with the clunky narrative choices to make her pivot from one perspective to the next without really justifying it, Doreen remains a delight. Her bubbly charisma and unrestrained bravado keep the tempo from dragging so much, and Tippy-Toe the squirrel is as adorable as ever. Whenever Kamala and Doreen share the screen, cracking jokes and sharing a familiar bond, the film pops. (When the pair catch a glimpse of Captain Marvel soaring overhead, Kamala sighs wistfully: “I want to be her. So. Bad.” Doreen: “We’re totally her!” Kamala: “…We’re weird.”) It feels, at these points, like the project approaching its best self. Unfortunately, those moments are all too infrequent. Lumpen pacing and half-baked subplots about Daisy and America don’t contribute much and are barely explained, let alone integrated smoothly. And the sound mix has a tendency to flatten things, usually when one of the overbearing songs sandwiched into the action scenes comes to the fore, with the bubbly pop confection playing over the climactic fight an especially ill-fitting choice. Not helping things is the action itself, which too often feels perfunctory and clumsily handled, much less smooth than Initiation. Marvel has a tendency to skimp financially on these productions, and it definitely shows here. Still, with such likable central characters, there’s no reason to think the further adventures of the Secret Warriors can’t improve with a little more attention to the weaker spots. No one’s asking for Pixar-level quality from a made-for-TV movie with so-so animation, but the phrase “fun for the whole family” should still be the goal.